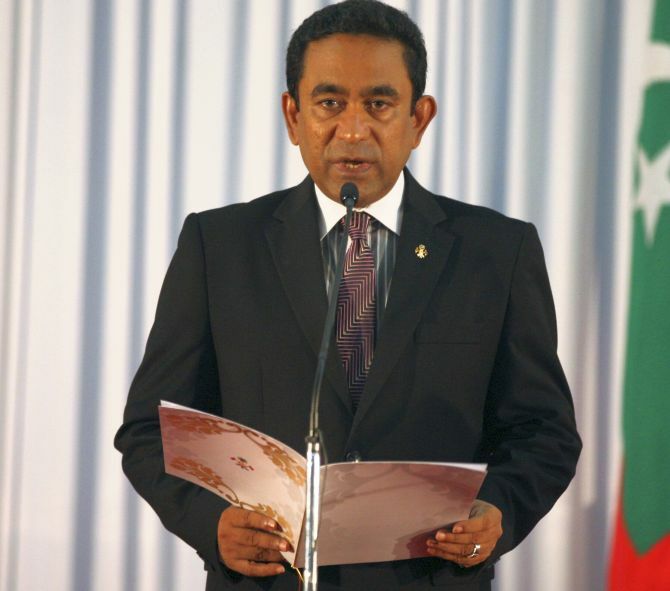 The Maldives government has declared a state of emergency for 15 days amid a political crisis in the island nation. Opposition leaders across the Maldives are being rounded up and placed under detention as draconian measures are being put in place by President Abdulla Yameen. Yameen, who has been defying the Supreme Court’s orders on releasing former president Mohamed Nasheed, and free eight other political opponents from prison, has now given sweeping powers to security forces in the country, which is facing widespread domestic protests against the president. According to the local media reports, Maldives’ Legal Affairs Minister Azima Shakoor read the announcement on state television. A Member of Parliament Abdulla Shahid took to Twitter to inform that an emergency has been declared in the Maldives. “President has just declared state of Emergency,” he tweeted. “All basic rights suspended. Security forces have sweeping powers to arrest and search,” Eva added. “This was expected and the only card left for President is this. Also according to article 258 of constitution Supreme Court can cancel State of Emergency,” a senior opposition leader said. Ambassador of the United States to Sri Lanka and the Maldives informed on Twitter that he spoke with the Chief Justice Abdulla Saeed to reiterate United States support for democratic freedoms. India expressed concern over the recent political developments in the Maldives and asked its nationals to defer all non-essential travels to the Indian Ocean nation until further notice. due caution in public and avoid public gatherings. “The prevailing political developments in Maldives and the resultant law and order situation is a matter of concern for the government. Indian nationals are, therefore, advised to defer all non-essential travels to Male and other atolls until further notice,” the advisory said.